When I blog about Greek food I try to avoid using Greek names to describe dishes as I find it a little bit pretentious and possibly quite confusing for non-Greeks. I will definitely be found guilty of doing the exact thing I’m pretending to dislike around this blog, but I do at least make an effort. Sometimes, it’s just a bit silly to say Courgettes, Aubergines and Potatoes baked with Tomato and Olive Oil rather than just Briam. I was thinking about an English name for this dish the other day while watching Masterchef when Gregg spoke the words “She’s making a Beef Stifado. Will it be enough to get her through to the next round?”. Well, if the word is good enough for Gregg, then it’s good enough for me. Because Gregg isn’t pretentious at all. Fact. So there you go: we’re almost at the end of the Greek month (the word month used in the most general way possible) and we are having Rabbit Stifado. Rabbit is a controversial meat I suppose, but I feel that we should eat most things and eat them in moderation. And if you think about it, rabbits have probably enjoyed a much better life than those battery chickens that haven’t got the space or the energy to move. Having said that, I managed to persuade Alex to do the dirty job of cutting it in pieces. It didn’t look like a great job. It was a bit messy but the idea is to try and cut it in half following the spine and then remove the 4 legs and any other meat pieces from around the main bone. We threw that away. If you want some proper advice on preparing the rabbit, there are quite a few useful videos on YouTube that we only thought of looking up after we had finished. 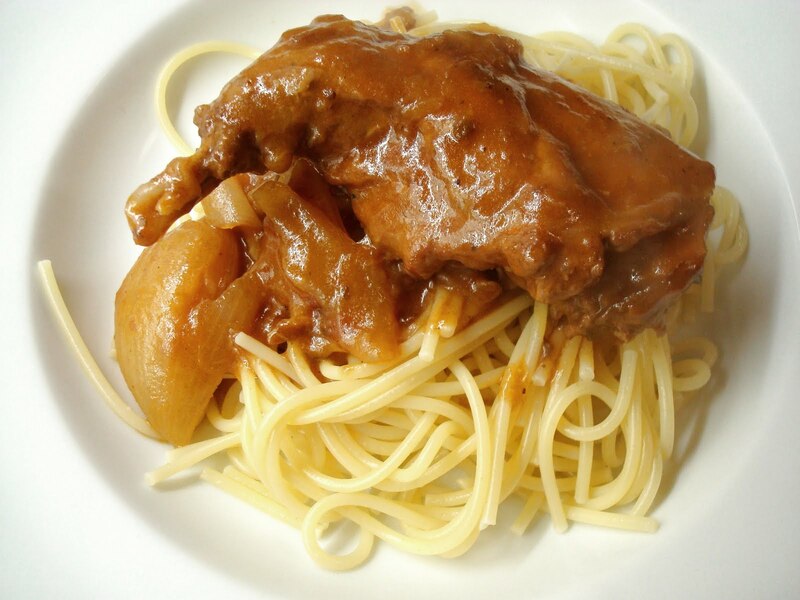 The sauce is simple, but very aromatic and I love the sweet onions. As it’s normally the case with stews, the longer you leave it to simmer, the better it becomes. Fry the rabbit in a bit of olive oil. If you like, you can first roll the rabbit pieces in some flour and then fry them. Slightly healthier if you don’t. When it’s nicely browned, add the onions, the garlic and the wine and boil until the alcohol evaporates. If you have fried bits of meat stuck to the bottom of the pan you can use a wooden spoon to scrape them off. Then, add the tomatoes, enough water to almost cover the meat and the cinnamon, allspice and pepper and cover. Let it simmer for a couple of hours or longer if possible. The meat will just get more and more tender. When it’s done, season with the salt. Serve with pasta or some good bread. I actually fancied some mash when I made it so I had it with that and it was really good with the lovely, thick sauce. The next day we had the leftovers on spaghetti, with some grated pecorino on the top. Very nice too. Next time on Round the World in 100 Recipes: Finishing off with a childhood sweet! I think it's important to give the Greek and the translated name of the dish. Greek food gets copied, neglected and bastardized so much. 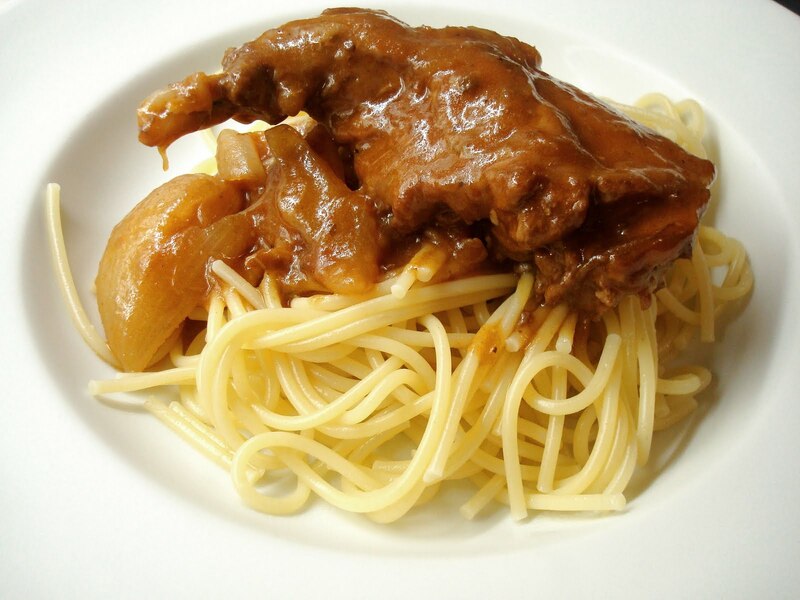 Rabbit Stifado is a Greek it gets and you've presented a wonderful version. I agree, to some extent. If it's something unique and very obviously Greek then I think that it's worth giving the name, as it's quite hard to describe it otherwise. And you want to relate a Greek dish to a Greek name. But if it's, say, a pie, I'll just call it a pie. No one will be able to pronounce or understand Kolokithopita for example, so I'd rather say Courgette Pie.